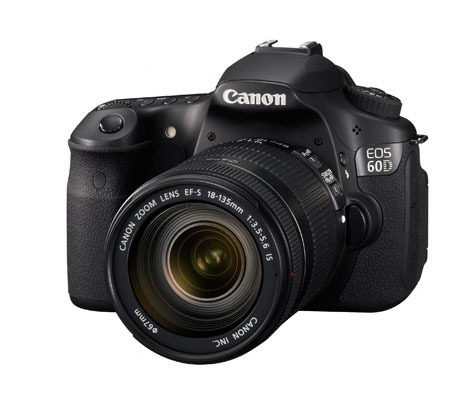 After playing with one at photokina, then continuing to study the specs, I have become quite tempted by the Canon EOS 60D DSLR body. It all started with looking for a replacement for my Canon T1i. It's a great body, and I've enjoyed shooting with it, but there are some new features that I want for my work, primarily better video controls and an external mic jack. Initially, I was looking at the Canon EOS Rebel T2i upgrade, but the 60D gives me a swing out LCD, faster burst rate, in-camera Raw processing, image resizing, creative filters, and more. Seems like for an extra couple hundred dollars, it's a better complement to my 5D Mark II. I'll let you know if I take the leap. As I said, I am very tempted. Adding a vignette in post production is one of those love/hate techniques. Some photographers think it's a powerful tool to move the viewer's eye to the most important part of the composition. Others think it is overused. I think how it is used is the most important factor. If you go to the fx tab in Adobe Camera Raw 6, you'll find a very flexible post crop vignetting tool that gives you the controls you need for an elegant application of this technique. Post Crop Vignetting applied in Adobe Camera Raw 6.1. Click on image for full size version. You have three styles to choose from: highlight priority, color priority, and paint overlay. I prefer the look of color priority for most images. Then you have five sliders: amount, midpoint, roundness, feather, and highlights. These give you the control you need to apply an artistic vignette. The approach I recommend in the beginning, is to move the amount slider all the way to the left. That allows you to clearly see how the other sliders work. This is especially helpful for the roundness slider -- that actually changes the shape of the vignette -- and the feather slider that applies a subtle graduation. Once you have those adjustments set, then back off the amount slider to the appropriate level. The Christmas Cactus without Post Crop Vignetting (preview is turned off). Click on image for full size version. As you can see, there is quite a difference between the two versions. And there are countless variations to what I've done here. 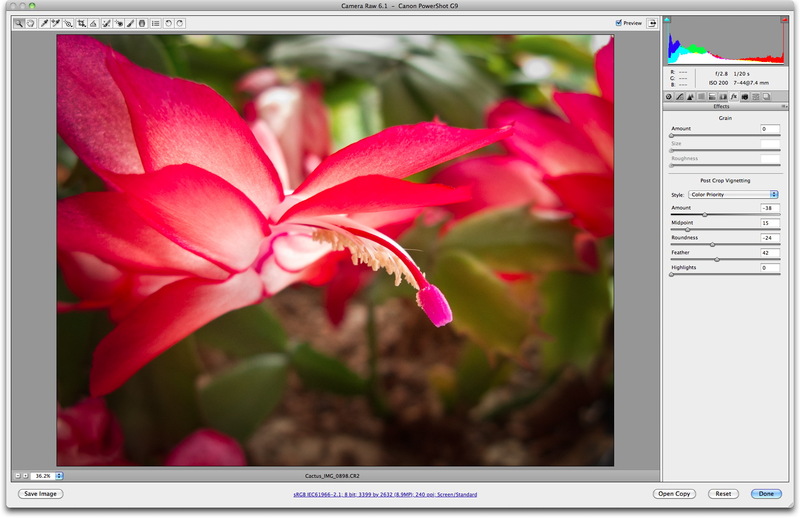 Keep in mind that when you work in Adobe Camera Raw, all of your edits are non-destructive. The original image is left unharmed, and you can go back and adjust the effect any time you want. 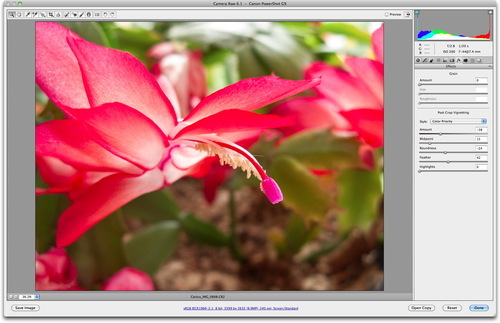 Adobe Camera Raw 6 is part of the Adobe Photoshop CS5 Upgrade along with Adobe Bridge CS5, which is included in the package too. Not one, but two podcasts for you today. I join Frederick, Steve, and Ron for This Week in Photo. We talk about travel (photokina, Germany, Oktoberfest), the new Nikon D7000, compact cameras, and color calibration. It's a good discussion that I think you'll enjoy. Then, on TDS Podcast 244, I tackle printing resolution. If you've wondered exactly how many pixels you need for various sized prints, this is a show you won't want to miss. Printing resolution can be confusing if you don't have a few guidelines to steer you in the right direction. In this week's episode, I'll take the mystery out of printing resolution, pixel dimensions, and file sizes. You can also download the podcast here (36 minutes). Or better yet, subscribe to the podcast in iTunes. You can support this podcast by purchasing the TDS iPhone App for only $2.99 from the Apple App Store. Fall is the October 2010 Photo Assignment. You can read more about how to submit on our Member Participation page. Deadline for entry is Oct. 31, 2010. The next TDS Photography Workshop will be Oct. 15-17, 2010. The event is sold out. But, you can place your name on the reserve list for the next workshop. Just drop me a line. In preparation for this weekend's TDS Fall Photography Workshop, I was hanging a few new SizzlPix on the classroom wall. I want workshop attendees to be able to experience these images firsthand. As I was looking at the shots, I thought what perfect gifts they would make this coming holiday season. I'm mentioning this now in case you think so too, so you'll have plenty of time to get your shots together. Imagine the double-delight when the recipient opens the box. First, they will see a handpicked image that you have been thoughtful enough to print for them. Then, they notice how the picture "jumps" out of the box. (If you have a SizzlPix, you know what I mean. And if you didn't know this already... SizzlPix is a sponsor of The Digital Story. So we have that to thank them for too! I continue to advocate that photographers have a camera with them when they walk out the door. It can be any type of device, as long as it's capable of taking the types of pictures that fit your style. 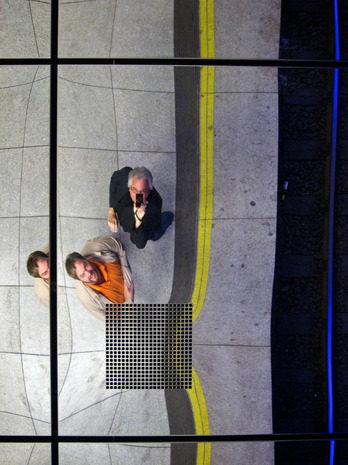 As an example of this, here's a self-portrait I shot while waiting for a train in Munich with my friend Oliver. I had a Canon S90 in my pocket (which has been recently updated to the Canon S95 ), and when I looked up, I saw this great reflective surface on the roof. Using the S90, I was able to frame one of my favorite portraits of Oliver and me in Munich. 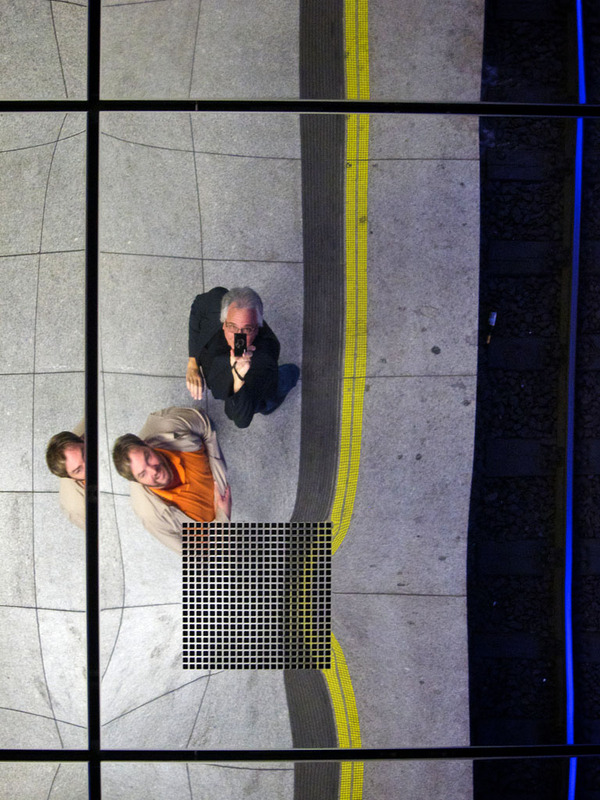 Self-Portrait in Munich. Click on image for a larger version. Photo by Derrick Story with a Canon S90. The thing is, whether I'm in Munich, San Francisco, New York, or at home in Santa Rosa, I have either the Canon S90 or the Olympus E-P1 1 with the 17mm f/2.8 Lens in my pocket or in my messenger bag that also holds the iPad. When we had a recent discussion about this on the TWiP podcast, some folks commented that they didn't want to be in "photographer mode" all of the time. I agree. There are many moments in life that I just want to enjoy without a camera in my hand. The thing is, there are also other moments when I really want to take pictures. And I don't know ahead of time what the day has in store. So I stand by my recommendation for photographers of all types. Have a camera with you, even if it's your smartphone. Because you don't know when a wonderful opportunity will present itself. I've talked a lot about hitting the road with only an iPad and some of the challenges involved with lightweight mobile computing. For example, how can photographers increase storage for their hi-rez images? Another concern in the field is replenishing the iPad's hefty battery after hours of use. Mophie -- the makers of the Juice Pack Reserve -- have come up with a new device: the juice pack power station. The $99 device has enough capacity (3600 mAh) to charge your iPad, iPhone and iPod. Its 2.1 amps of high-density, high-output charging has the horsepower required to replenish that thirsty iPad battery. It also has many helpful features such as LED status lights and pass though charging (you can charge the powerstation and your device at the same time) while remaining quite compact. I think backpackers and photographers working in the field for extended periods might find the powerstation a real blessing. The updated Lowepro S&F Series will be officially launched in the US at PhotoPlus Expo on October 28. There are many innovative components in this system, but the one that I think will thrill just about every shooter is the new Lens Exchange Case 200 AW. 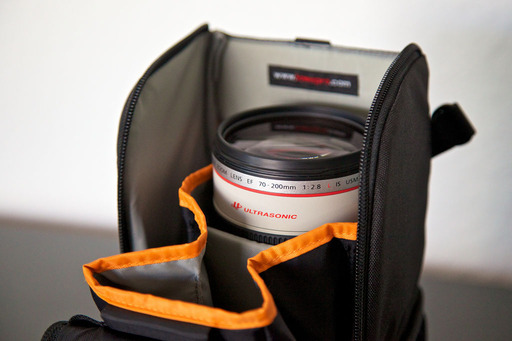 The Lowepro S&F Lens Exchange Case 200 AW. Click on image for larger version. Photo by Derrick Story. Not only does the case fit securely on the belt of the S&F Series, you can use it on a regular belt too. It has an All Weather cover to protect your glass in the harshest of environments. But the real treat is that it also serves as a second pair of hands. The case actually has two compartments that compress into one case. When you take the lens off your camera, simply put it in the open compartment. Then take the lens you want to mount out of the other compartment. Pull the case closed with one hand, and you're shooting before you know it. Here's a video demo of how that works. The Lowepro S&F Lens Exchange Case 200 AW should be available in November 2010. If you really want to "wow" your favorite photographer with a great gift during the holidays, this affordable item is the ticket. Photography workshops provide an experience that you just can't get online. The combination of hands-on instruction, shooting on location, and direct interaction with other participants can inject renewed enthusiasm into your craft. This week I discuss some of the things that I think are important when considering a photography workshop to attend. You can also download the podcast here (22 minutes). Or better yet, subscribe to the podcast in iTunes. You can support this podcast by purchasing the TDS iPhone App for only $2.99 from the Apple App Store. The next TDS Photography Workshop will be Oct. 16-18, 2010. The event is sold out. But, you can place your name on the reserve list for the next workshop. Just drop me a line. The Giottos VGR9255 is an aluminum tripod/monopod with quick release ball head that fits easily on the outside of your photo backpack. I recently spend a week on the road with one strapped to my Lowepro Pro Trekker 300 AW as I worked in Germany. This Giottos only weights 3 lb (1.36 kg), yet extends to 62.6" (159cm). 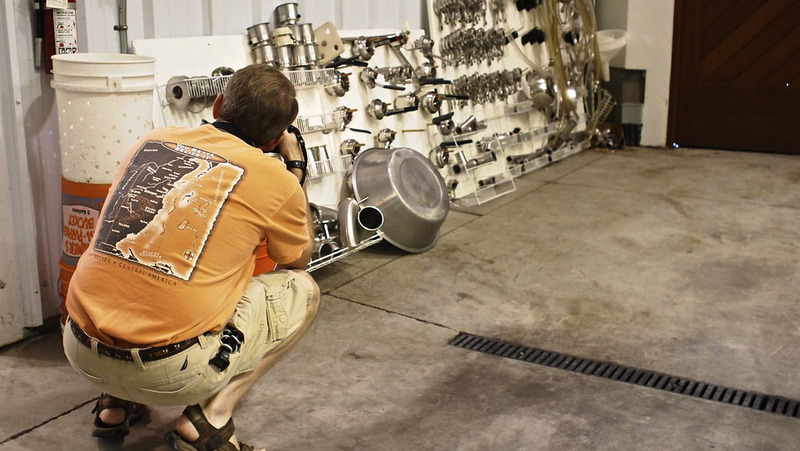 And when it's time to fold it up to pack in the suitcase, it only takes up 15.6" of space thanks to its ingenious "reverse technology" legs, that when collapsed, fold 180 degrees and surround the tripod center column and head. This also means that you have great flexibility in positioning the legs at any angle you may need while shooting. The dual-control ball head is high quality. The movement is smooth, and when you lock it down, it's solid. The Giottos also includes a quick-release mount for your camera. All of the twist-knob adjusters on the legs and center column are equally silky and secure. 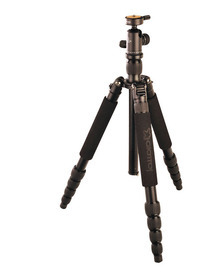 This is a tripod that inspires confidence just by working its controls. You can convert the Giottos to a monopod by unscrewing one of the legs and attaching it to the center column. Even though I think this is a terrific option, I didn't use it as much as planned because the tripod itself is so nimble, even in tight quarters. I also like the retractable hook at the bottom of the center column that can be used for hanging any type of weight to further secure the legs. For $245, you get the tripod, ball head, deluxe case, and carry strap. Considering the quality of the ball head alone, that's a good value. You won't hear me say this too often about sticks, but the Giottos VGR9255 tripod is actually fun to use. And it won't break your back or your bank account.